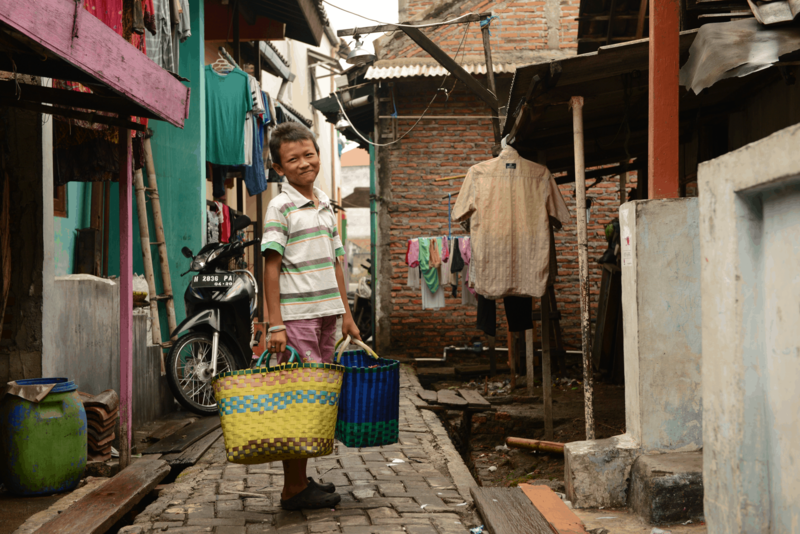 Eleven-year-old Samuel lives on the island of Java in Indonesia. Most people in his village make money by catching fish and then selling them at markets. 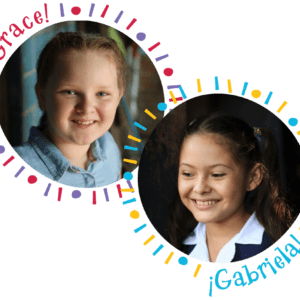 But many families don’t earn enough money to meet their needs for nutritious food, medicine, clothes, clean water and school supplies. Selling fish isn’t the only way to earn money in Samuel’s village. On Christmas morning, like every morning, Samuel walks past homes on his way to a cafeteria where fishermen eat. He carries baskets filled with packed lunches of rice, noodles and tofu. 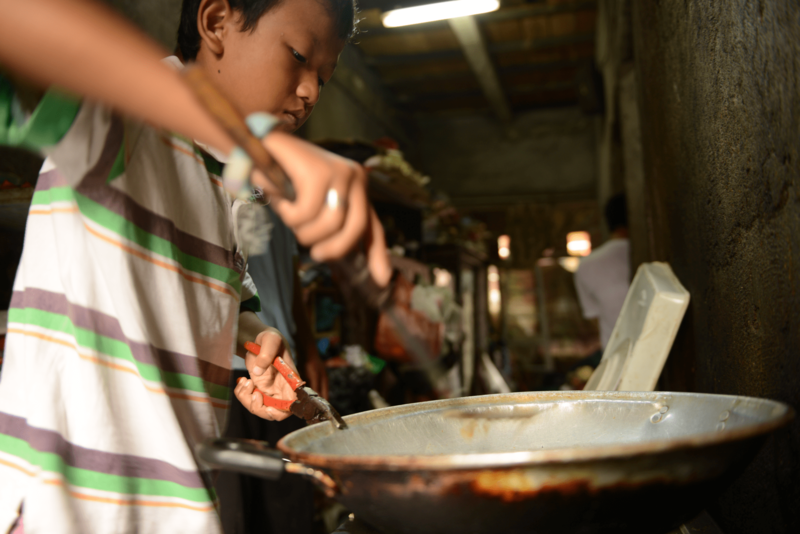 His parents wake up daily at 2 a.m., even on Christmas, to cook the lunches. Then Samuel and his sister get up at 4 a.m. to help pack the lunches and later sell them. After they finish selling lunches, Samuel goes with his parents to fish in a river by their home. The family doesn’t earn enough money to buy much food, so they go fishing to catch something to eat. Samuel also gets nutritious meals, health care, tutoring and Bible lessons from Compassion because he is sponsored. Samuel decorates a plastic Christmas tree. 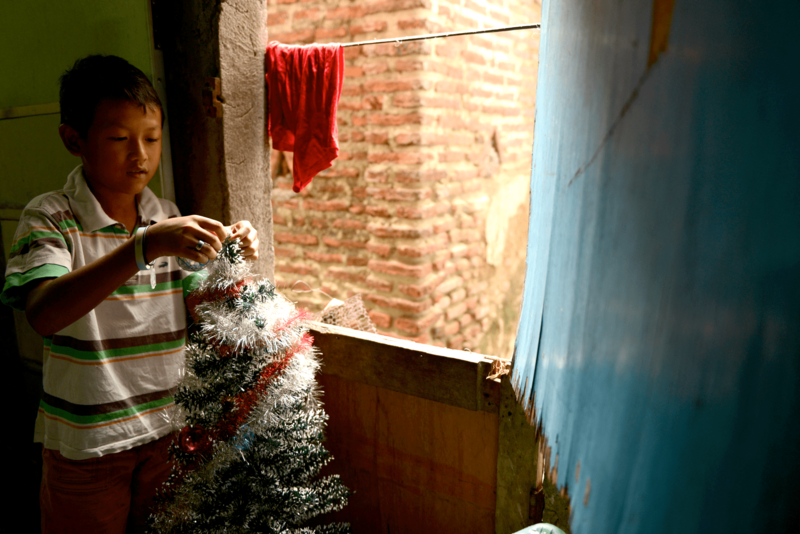 Before he was in Compassion’s program, his family could not afford a tree. But Samuel received this one during a Christmas celebration at his Compassion center, where kids learn about Jesus and receive Bibles. The tree adds cheer to the small home where he lives with his parents and sister. His family went to a Christmas Eve church service. 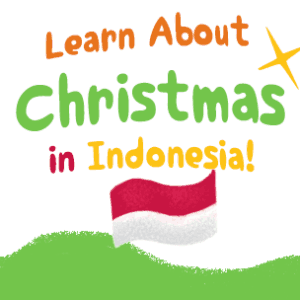 For Christmas dinner, Samuel helps cook one of his favorite meals: nasi goreng. It’s rice fried with eggs and spices. After Samuel finishes cooking, he and his family sit down for the Christmas meal together and thank God for their food.